There are those who think that Scrappy is too specific a subject for a Web site. Hah–here at Scrappyland, we’re beginning to think he’s too general a topic. 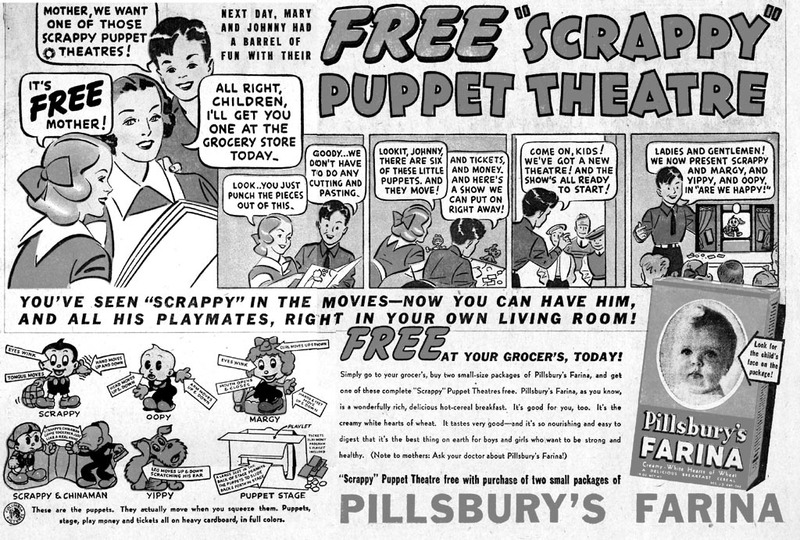 There’s so much stuff relating to just one aspect of Scrappy–the Puppet Theatre premium that released as a tie-in with Farina in 1936–that we’ve been forced to add this entire section about it. If we discover anything else concerning the theatre–and we probably will–it may warrant an entire site of its own. Inside the pressbook were…two smaller pressbooks. Yes, that’s Scrappy waltzing with a box of Farina. Click here or on the covers below to get the entire press books as a 14-page PDF for easy reading. And worth reading they are–there’s tons of stuff in them, including ideas for strongarming schoolteachers into helping to promote Farina, and reference to a “Scrappy Says” newspaper feature of allegedy immense popularity. Also included in the pressbook was this poster (image courtesy of David Welch’s Childhood Memorabilia) for grocery stores. Say, are those Mary and Johnny from the newspaper ad? I have Scrappy’s Theatre listed on eBay right now at only 99 cents, just in case you know anyone who’s interested. Thank you for such a great site! I loves me some scrappy! Thanx for reviving this classic! I love Scrappy so much that I want to do an “homage” to that cartoon style. Could I post some artwork to see if it worthy?